If Adam Gurri’s a recovering libertarian, then I’m a recovering anarchist; but while his exit vector has been through virtue ethics and hermeneutics, mine was through evolutionary biology and the mathematics of complex systems. It is in giving up one’s cherished beliefs that one’s thinking is given teeth, and the starting point for me was with two works of “systems history”, Jared Diamond’s Guns, Germs & Steel and Manuel DeLanda’s A Thousand Years of Nonlinear History. The former attempts to outline a naturalized account of European colonization, a topic traditionally enjoined to a rhetoric of self-congratulatory supremacy or scornful retrodiction. The latter abandons teleology in favor of witnessing history as a series of movements of systems in and out of equilibrium. Equilibrium need not mean stasis, as complexity theory demonstrates. Predator/prey systems are an example of binary equilibria, where adaptations by the one are met by adaptations by the other (the so-called red queen effect). More generally, however, the tools of the sciences can be turned on systems of ideology and political philosophy, and used to examine some of the unspoken assumptions behind them. For instance, idealists keep returning to the notion of a clean break, a revolutionary transformation of society that will result in a situation of high collective satisfaction. They’re even right! History demonstrates that human collectivities can experience significantly higher satisfaction, at least in bursts: the Paris Commune, or Burning Man, or even the vibe in Tahrir Square when Mubarak was ousted, all represent kinds of temporary autonomous zones of liberated living. Nevertheless, they were all physically and temporarily constrained, and the status quo that subsequently obtained left much to be desired. In a physical system, a gradient describes a situation that is far from equilibrium. The second law of thermodynamics, therefore, implies a statistically-certain movement towards a higher-entropy state; in an open system, it would entail harnessing the energy from another gradient to arrest the entropic decay of the first. The problem of revolutionary politics, in sum, is one of thermodynamics. There is no second gradient sufficient to provide sustained energy in quantities large and consistent enough to see the revolution secured. The terrible, bloody end of many revolutions is a fruitless gesture of a King Canute attempting to command the tide to stop. This, therefore, is the rationale behind institutions; they are the ponds carved out of the mountain face to ensure that not all the water runs out to sea, particularly when generations may go by without rainfall. To shift metaphors, diverse political systems may be thought of as fitness landscapes as used in evolutionary biology. The peaks represent optimal fitness, and assuming a stable environment and random mutation, a population will gradually ‘climb’ the nearest hill available to them. This hill may represent small, fast-moving wings and a long, thin beak for drinking nectar, or an elongated neck and a predilection for particular leaves. 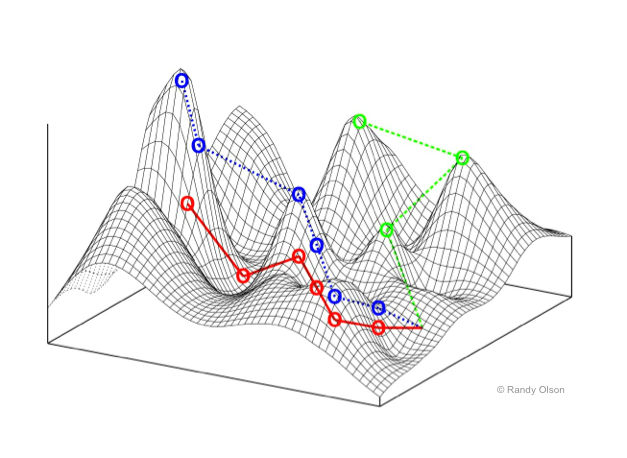 In theory, the abstract (‘virtual’) topology of the fitness landscape could represent other peaks that are improvements over the one being climbed, but there may be no available path from point A to point B. Repeated insistence on how much higher another peak would be does nothing to move the population across the valley—unless, of course, this counter-productive direction is fueled by some other force that negates the drift towards short-term fitness—this is the nature of selective breeding, for example. Using this topology, then, you can imagine revolutionary movements as sharp spikes in the fitness landscapes: maximally fit, but tragically destructive if one moves only a little in any direction. Given the natural random jostling around any population experiences, conservatives are correct to judge such a pinnacle as existentially precarious. Their preference for gentle inclines and plateaus means that sudden moves in any direction do not yield dramatically different results, but having reached the plateau, there is a tendency to justify one’s altitude with a rhetoric of post hoc lesser-evilism. Of course, all this assumes a static environment and an absence of feedback loops between the population and the ecology, when in fact both are highly dynamic. As a result, the conservative impulse to preserve gains held, reasonable when moving up a small hill surrounded by deep valleys, is paralyzing when land bridges appears, or when the hill one was ascending suddenly plummets. Everyone wants to be the butterfly flapping its wings in Tokyo, causing a hurricane in California. But the implicit premise is that the system itself is far from equilibrium, and that there is more than one attractor. But not everyone can be Mohamed Bouazizi, and if Bouazizi hadn’t been, another Tunisian would’ve, because the situation itself was unlikely to stay on the knife’s edge. A pure power politics is a single-attractor system that sees the cynic acquiesce and the activist crushed by the Sisyphean burden of fate. Politics understands that change comes easiest not by forcing large stones up steep hills, nor waiting for the perfect butterfly moment to strike, but by terraforming the social landscape. This implies a knowledge of what the structural elements of the social consist of, and in this it seems we are still woefully ignorant. We allow ourselves to be distracted by national politics when the most substantive actions happen at lower (state and city) or higher (trade agreements, treaties) resolutions. We are more captured by the names of things then their realities (treating, for example, Iraq, as ‘a’ nation-state). Our political vision is weak, inveterately biased towards the status quo and our vocabulary actively misleads us. We frame issues of coordination as wicked problems, giving up before we’ve begun. It is far more useful to approach challenges from the perspective of the scale of existing capabilities, and asking how much capability growth can be creatively accelerated without triggering collapse in the mechanisms themselves. …judge. Where the facts are most obscure, where precedents are lacking, where novelty and confusion pervade everything, the public in all its unfitness is compelled to make its most important decisions. The hardest problems are those which institutions cannot handle. They are the public’s problems. Publics are short-lived assemblages that live, grow and die in a blink relative to the lifespans of their host civilizations; from school board meetings to Black Lives Matter. We’ve become so acclimated to only understanding activities that have been culturally-coded “politics” as political that we forget that the entirety of our culture is a sedimentary rock laid down by the processes of politics, from public hygiene to the existence of trade. Here is a Copernican revolution of radical proportions: to finally make politics turn around topics that generate a public around them instead of trying to define politics _in the absence_ of any issue, as a question of procedure, authority, sovereignty, right and representativity.